Good morning distinguished speakers, honored guests, and all ladies and gentlemen in attendance. We thank you for being with us today, and I’m excited to officially welcome you to NextGen Aging: Shaping a Smart Future for an Aging Society. Before we get started, I’d like to give a heartfelt thank you to our sponsors: Krung Thai Bank, Thonburi Healthcare Group, Government Savings Bank, Bangkok Bank, Thailand Health Foundation, and Muang Thai Life Assurance. Without their generosity and commitment, this important event would not be possible. I’d also like to thank the American Chamber of Commerce in Thailand and the Sasin Graduate Institute of Business Administration of Chulalongkorn University for their valuable inputs as our resource partners. 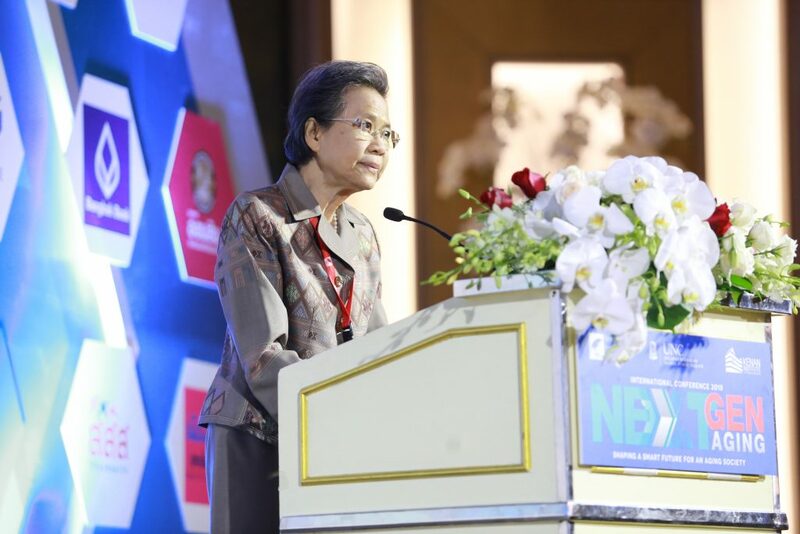 Kenan Foundation Asia is proud to host this conference, the first large scale event about the intersection of aging and technology ever held in the Kingdom of Thailand. For those of you who don’t know us well, we’re a Thailand-based non-profit organization working to empower people with the knowledge, technology, and skills necessary for a better future. In pursuit of our vision, we identified aging as one of the mega-trends impacting Thailand and the region that we are well-positioned and eager to address. In 2016, we launched the Pfizer Healthy Aging Society Project with support from the Pfizer Foundation, our largest program on the issue to date, which is working with pre-seniors and seniors in Bangkok and Ubon Ratchathani to help reduce instances of non-communicable diseases such as diabetes and hypertension. The project has improved the lives of over 4,000 community members in its first two years, and we look forward to analyzing and sharing the results to see how its positive interventions can be scaled nationwide. On behalf of Kenan, I’d also like to thank the University of North Carolina at Chapel Hill for co-organizing this event with us. We have been active in Thailand for 23 years, and UNC has been a trusted partner every step of the way. We’ve worked together to tackle a range of issues, from malaria eradication to rural economic development. And now we’re embarking on a new journey to help Thailand overcome the challenges of an aging society. We’re pleased to have two distinguished experts from UNC here today: Dr. Noel Greis, who will speak about global innovations that are being developed to solve the challenges of aging, and Dr. Ed Fisher, one of the foremost global leaders in building peer-to-peer networks, which have proven to have a profound effect on increasing the mental and physical wellness of seniors. To be sure, there is much we can learn from our colleagues in the United States, a country that is going through a similar demographic transition as the Baby Boomers enter their golden years. We’re grateful to have Dr. Porametee Vimolsiri, Permanent Secretary of the Ministry of Social Development and Human Security, here to deliver the keynote address on ‘Innovation in an Aging Society’. I, for one, am very much looking forward to hearing from Dr. Porametee in just a few minutes. So why are we here today? Over the past half century, two quiet trends, declining fertility rates and rising life expectancy, have merged, resulting in a situation where a greater and greater proportion of society is elderly. We see this same demographic pattern in countries spanning the globe, including China, the United States, Japan, Singapore, and Germany, to name a few. The United States, for example, will have 78 million people over the age of 65 by 2035, at which point seniors will outnumber citizens 18 and under. In Japan, the situation is even starker, where currently 1 in 4 citizens is 65 or older, and by 2040 the proportion will rise to an astonishing 36%. Here in Thailand, senior citizens account for about 15% of the total population as of today, a figure that will surge to more than 30% within the next 15 years. Thailand, however, is unique from the other aging societies, in that it is not yet a developed country. In fact, Thailand will soon become the first developing country in the world to reach “hyper aged” status, although China will not be far behind. What are the effects when a society undergoes an aging transition? As you will find out from our excellent speakers, aging is a cross-cutting issue that touches multiple industries and sectors of society. Healthcare costs will rise, housing and infrastructure needs will change, and pension policies will need to be reimagined. As the working age population shrinks, how will governments and businesses respond? Will retirement ages be pushed up? Can automation make up for labor shortages as seniors enter retirement? How will governments provide entitlement programs to those in need as tax revenue declines? What does aging mean for economies overall? I’m eager to listen to what the experts in attendance have to say as they discuss, debate, and share their insights about the pressing issues at our doorstep. It is easy to become overwhelmed by the challenges we face, but we must also recognize the exciting opportunities that demographic change presents to policymakers, organizations, companies, and entrepreneurs who dare to innovate. In fact, esteemed business thinker and educator Peter Drucker argued persuasively that demographic change was 1 of the 7 sources of innovation. Throughout the day, we will explore how forward thinking individuals, whether in the business, government, or social sectors, can leverage cutting-edge technology, such as artificial intelligence, FinTech, and machine learning, to provide the services and products that our growing senior population needs. Later in the afternoon, you will even have the opportunity to experience some of these new age technologies at our exhibition showcase of technologies for healthcare and aging. To close, I’d like to note that we often think about demographic issues in big picture, macro-level terms, which are of course critical to explaining the present situation and finding solutions, but we should never forget about the on the ground circumstances faced by individual people. I’m reminded of the story of Khun Wanla Kamnin, a woman in her late 50s living in Bangkok’s Klong Toei slum. When we first met her a couple of years ago shortly after beginning the Pfizer Healthy Aging Society Project, she was in a bad place. She had been forced to close her small hair salon, which was both her only source of income and her joy, because she suffered from diabetes and her health was declining quickly. When Kenan entered Klong Toei, she was receiving inadequate healthcare, was afraid to visit the doctor, and persisted in her bad habits, poor nutrition and lack of exercise, that led to her health problems in the first place. I’ve talked a lot about technology and innovation, but these forces cannot replace the human element. We didn’t wave a magic wand or use an algorithm to change her habits. Instead, we went into her community, into her home, and listened to her, provided her with easy to understand and practical knowledge that she could use to help herself, while bringing her into a larger community of her peers who encouraged and inspired her to improve. In time, her diet changed, her habits changed, her mindset changed, and, most importantly, her health improved. Today, I’m proud to say that Khun Wanla serves as one of our community change agents who organizes neighborhood meet-ups to share knowledge and encourage her neighbors to adopt healthy habits. Her story is a testimony to the fact that we need effective and efficient public health programs to help the neediest members of our societies. If we can make the exciting technologies of the 21st century complement our healthcare systems, then I really believe our societies will thrive in the graying era. And this is what Kenan Foundation Asia is about, empowering people to achieve their dreams. It is our sincere hope that by day’s end, you will know the challenges our societies are facing, while being enthusiastic about the opportunities for businesses, governments, and individuals to develop innovative solutions to the problems of an aging society. Make no mistake about it, our societies are at an inflection point, and it is up to all of us to think deeply about how we can support a stronger, more equal, and more prosperous society as it ages. Thank you again for being with us today as we explore the next generation of aging.